After a long wait, the Battlecruisers Kickstarter is finally live! In fact, it's been up for almost a week. We have funded and are now busting through a number of stretch goals. You can also snag a copy of Eminent Domain: Exotica by Seth Jaffe (another EmDo expansion). 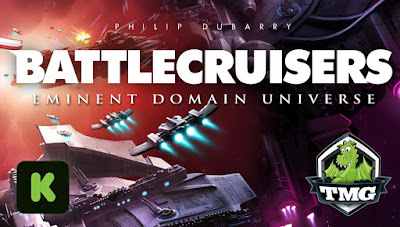 Battlecruisers is a stand-alone customizable mini-game. Thanks to all the loyal TMG fans for supporting these games!